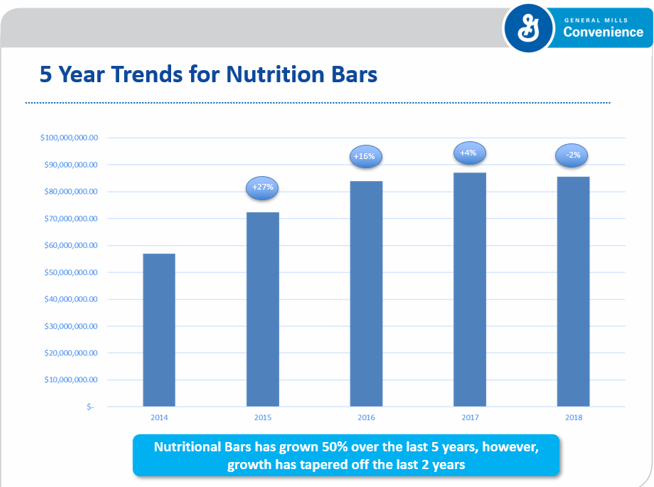 Snack Bars have increased 50% in sales growth over the last 5 years. Snack Bars sales trends are now flattening after 4 years of steady growth, but remains a $85 million dollar category in convenience stores on the West Coast. What’s driving this nutritional sub-segment? processed foods with chemical additives. Consumers who lead a vegan lifestyle choose to stay away from products derived from animals, whether it be food, clothing or accessories, and they opt for healthy substitutes for meat, dairy and other conventional sources of protein. A vegan diet is perceived to be healthier than a meat-based one. It is estimated that over 7.8 million Americans follow a vegan diet and lifestyle. With the increasing vegan culture, packaged foods like granola bars that have vegan specifications are growing increasingly popular among consumers. As a result companies are driving more varieties of vegan snack bars such as Lenny’s & Larry’s and others. With 80% of U.S. consumers snacking at least once a day, protein and fiber are the two ingredients consumers look for in snack bars. Millennials, baby boomers and other groups are consumers of high-protein snack bars. manufacturing of snack bars. For example, pea protein is used in the making of snack bars, as it contains around 90 percent of protein. In addition to that, it is highly digestible and gluten-free. It is ideal for those who follow diets that have a low glycemic index. Performance bars (Heavy Protein) + wellness bars make up the nutritional bar segment and account for a large and growing segment of the category. The treat bar category is sitting at 16.4% with options that are indulgent. The last sub segment is the grain bars at 12.3%.